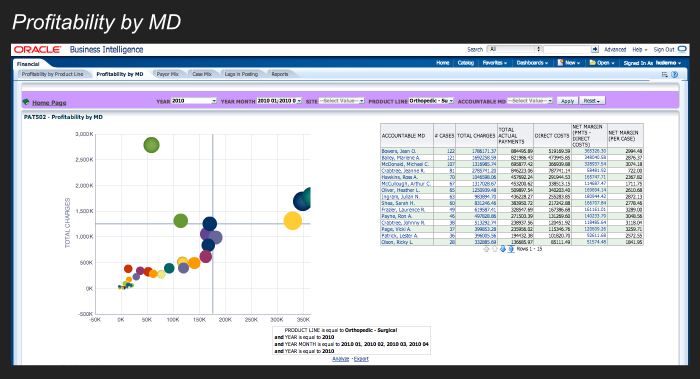 Result: When you see staffing trends for PTO, UPTO, OT and other workforce trends against volumes and cases, you begin to see patterns in the way labor is used based on seasons, patient volumes and DRGs, not to mention employee. Now that the labor ratios are pin pointed and reflected in real time every day, managers can dote on the enterprise and be sure that your staffing resources are deployed as the result of informed labor choices. Problem: How do you analyze operational throughput and quality efforts, all the while perceiving their financial implications? Connecting operations to the hospital’s silos of systems is the missing piece of the profitability puzzle. Silo-ed systems of operations and quality management create systemic inefficiencies in healthcare systems. Doesn’t everything have a financial impact? So why not understand how your efforts to reduce LOS, re-admissions and to keep patients safe and satisfied all the while documenting core measures, can lead to financial gain or loss. Are you providing quality cost effective services which offer value? Payers want to know so shouldn’t you? 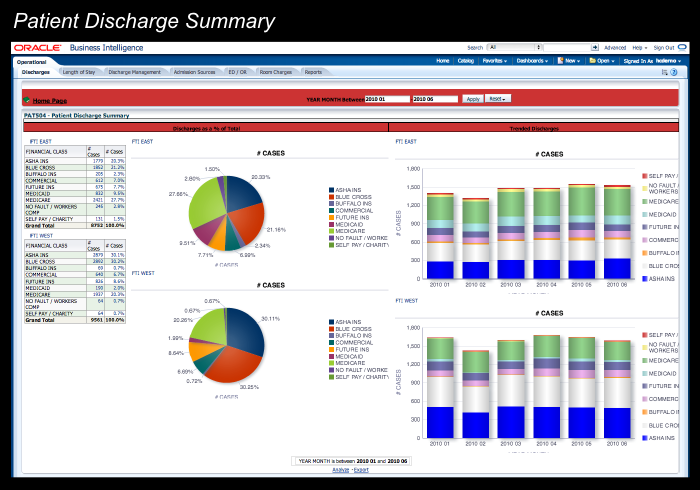 Discharges and admissions, LOS and nursing unit performance as well as case mix need attention in real time in order to effectively manage performance in complex healthcare delivery system. Solution: Aculyst is helping hospitals increase admission volume and decrease LOS with enhanced throughput in units such as OR, ED and SNF. The goal is to reduce ALOS, lower direct costs, increase admission volume, as well as improve quality and safety measures. This is done by delivering dashboards that allow the end user to see KPIs and interact with the data that sheds light on business problems. Result: Discharges, LOS and census as well as quality such as patient safety, satisfaction and re-admissions are all indicators of service line productivity, profitability and overall enterprise value offered. Payers, patients and the government are interested in how you deliver value. 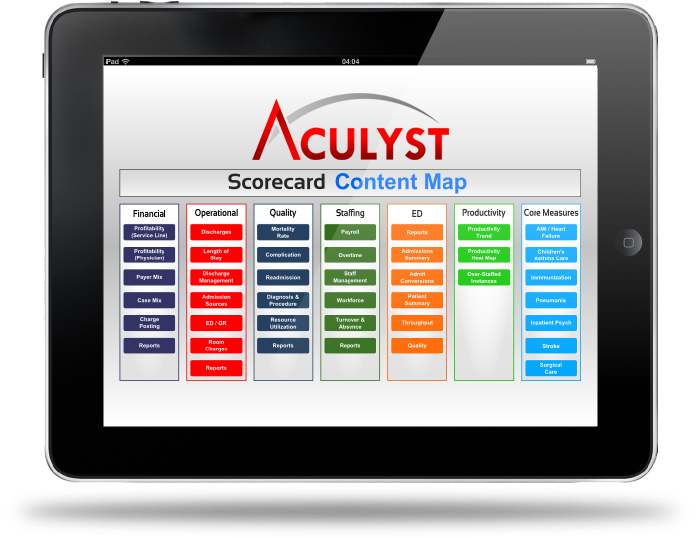 Aculyst gives operational managers and CMO’s the tools for ‘awareness’ they need to be sure they are on track to reach hospital targets, all the while overseeing quality measures and clinical outcomes in one system. This means you can speed towards value and be confident your enterprise is on target to meet its goals. Result: Population health management requires better IT solutions in order to understand how to improve outcomes through disease management, care management, and demand management. Providers and organizations will begin to see data to analyze morbidity patterns and predict financial risk. Both clinical and financial outcomes are improved by comparing patient data against quality guidelines and identifying care gaps..